It is certainly a rare event when you find the perfect #1 issue of anything. 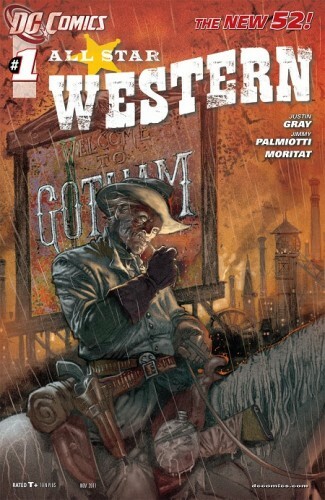 While plenty of DC’s first issues have been amazing, All-Star Western will be hard to top. From the beautiful yet dark opening shot of the Gotham City Train Station to the shocking cliff hanger at the end, this was a perfect 10 issue if I’ve ever read one. Those who have never read Jonah Hex, but take an interest in Batman and Gotham City will find plenty to love throughout the issue. This already corrupt city, post Civil War, has plenty of recognizable last names that Batman fans will recognize immediately. Early on we meet Dr. Arkham who teams up with Jonah Hex to help solve a series of murders by a killer that goes by the name of “The Gotham Butcher.” The two become an unlikely duo, despite Jonah Hex’s threats, and Arkham winds up doing a psychological study of Hex taking notes throughout the story. Arkham is both frightened and fascinated by the way Jonah Hex conducts himself using violence to get answers and showing no remorse. Later on we are introduced to more familiar Gotham family names like Cobblepot, Wayne, and more. 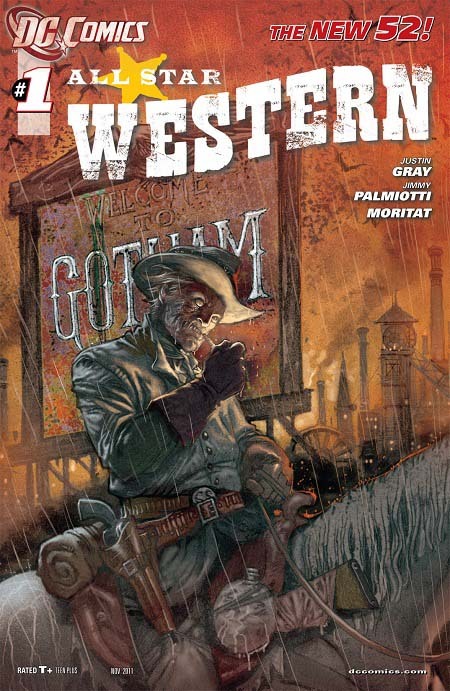 It’s a great Gotham history piece on its own, but is fleshed out with murder mysteries, western action, and Jonah Hex’s usual dark comedy. The writing team of Jimmy Palmiotti and Justin Gray tell a flawless story that should have been the direction of the Jonah Hex movie. Artist Moritat hits a home run with a very bold yet minimalist style of art full of movement and emotion. He does a great job of showing the density of Gotham City which differs from most Jonah Hex books where he is out west among sparsely populated areas. The colorist Gabriel Bautista chooses a complimentary color palette that suits the gritty style of the story and the art. Heavy shades of brown, orange, and rust help to keep the tail grounded in its timeline of the 1880’s. I know that having easy jumping on points for the #1’s was important for DC and this book is a prime example of how to do that properly. If you didn’t know anything about Jonah Hex or Batman coming in to it, this would still be a solid read. It’s a classic mystery set in western times that can be enjoyed by anyone who enjoys good fiction. If you have been reading Johah Hex and any of the Batman titles there are plenty of little Easter eggs throughout to keep fans happy and searching for more. This one is well worth the 3.99 price tag and I did not want it to end. I will be picking this series up for the long haul for sure. Trailer – Batman Arkham City video game Meet Mr. Hammer! Not to be confused with MC Hammer. I enjoyed the series threw all its up and downs . Kinda lost interest with Booster Gold but actually enjoyed Jonah in the present but was disappointed when he returned and his girl friend died right away . But collected it right to the end .